We’d love your help. Let us know what’s wrong with this preview of No God for a Warrior by Jan Turk Petrie. To safeguard the rule of law, Nero has to survive long enough to expose powerful figures who would ransom the city to the highest bidder and bring an end to its freedom. Continuing the riveting Nordic saga of survival, loyalty, betrayal and love. To ask other readers questions about No God for a Warrior, please sign up. Great to be drawn even further into Petrie's world of Eldisvik and to follow Nero Cavallo as he struggles to cope with his injuries whilst trying to track down a mass murderer. 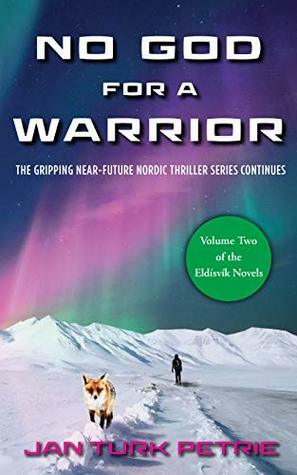 A novel full of mystery, twists and turns in a world of rogue agents, genetically altered vixens and conspiracy set in Eldisvik perched on the edge of the Arctic. Jan Turk Petrie is the author of the new, fast paced Nordic thriller series: the Eldísvík novels. All three of these gripping novels are set in 2068 in a fictional city state just below the artic circle. 'Until The Ice Cracks' - the first of the trilogy was released in July 2018. The third and final volume - 'Within Each Other's Shado Jan Turk Petrie is the author of the new, fast paced Nordic thriller series: the Eldísvík novels. All three of these gripping novels are set in 2068 in a fictional city state just below the artic circle. A former English teacher with an MA in Creative Writing from the University of Gloucestershire, Jan has also written numerous, prize-winning short stories.